Our Archery hunts take place in the foothills and mountains of the eastern slopes of the Canadian Rocky Mountains, in the prairie regions of southern Alberta, and in the Calgary Bow Zone. These hunts take place from late August until the end of November, with accommodations ranging from tent camps through working ranches and B&Bs to local hotels/motels. 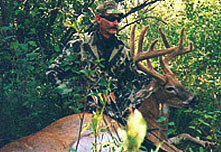 THA's Archery Whitetail hunts offer exceptional opportunity rates for the proficient archer. Twice in recent years, THA has won the Alberta Professional Outfitters Society award for 'Largest Whitetail - Archery on an Outfitted Hunt' out of over 450 outfitters in the province. We offer three distinct types of Archery Whitetail Deer hunts as summarized below. These hunts are operated in the forested area leading into the slopes of Canadian Rocky Mountains (WMUs 318, 320, 322, 324, 326, 330 & 429). These areas have much more cover for whitetail than is available for our Foothills Archery Hunts. The season is much shorter since the rifle season in these WMUs generally opens in mid to late September. Ground blinds, some tree stands and limited spot & stalk are the preferred methods to hunt these dark-horned monsters. Their spruce rubbed antlers are much darker than their open country poplar rubbed cousins in the Foothills. Accommodations are at a B&B, full service lodge or a local motel. Similar to our Foothills areas, our Mountain Archery Whitetail Deer hunts generally occur during the annual velvet to initial hard horn stage of a buck's development. We are able to hunt these trophies during the very early season when they have not been hunted for many months and remain largely undisturbed. Due to the nature of the mountain habitat and terrain, hunters will not see as many mule deer on our Mountains Archery hunts as on our open country style hunts. We conduct these hunts annually from August 25 > October 31. Our Prairie Archery Whitetail Deer hunts occur in the wide open prairies of southern (WMUs 104, 106, 110, 132, & 134) and are spot & stalk hunts for Alberta's classic trophy whitetail deer. The land consists of mostly privately owned agricultural and grazing areas rich in food and water sources for deer. Tim Wells bow hunted whitetail on these hunts for three years in a row and harvested 3 P&Y whitetails including his 195 P&Y whitetail harvested with Trophy Hunters Alberta. Tim also harvested another 'Largest Whitetail in the province' two years later. The following year, he was chasing another big one, however had to settle for a nice mule deer. In eleven straight years of hunting with THA, Tim has harvested over a dozen P&Y deer. Spot & stalk and ground blinds are the preferred methods to hunt these free ranging, open country Whitetail Deer. Transportation during these hunts is generally by THA 4x4 with moderate to extensive walking required depending on your level of physical fitness. Accommodations are at a ranch, B&B or local motel. Our Prairie Archery Whitetail Deer hunts generally occur during the annual velvet to pre-rut stage of a buck's development. We are able to hunt these bucks during the pre-rut when they have not been hunted for many months and remain largely undisturbed. During these hunts, we will do lots of spotting, walking and careful, planned approaches in open country. We conduct these hunts annually from September 1 > October 31. The Calgary Bow Zone (WMU 212) is a private land hunting zone renowned world wide for its record class deer. This is a productive hunting area where archery is the only legal method to hunt big game. It is one of the two areas in Alberta where archery hunts are allowed during the annual rut without the usual incursion of rifle hunters. Although access is always a challenge in this area, our success rate is generally very good. Ground blinds and tree stands are the preferred method to hunt these Whitetail Deer. We only utilize spot & stalk when the habitat and terrain are conducive to this style of hunt. We never want to chase our whitetail from accessible land to posted land. Transportation during these hunts is generally by THA 4x4 with limited to extensive walking required depending on your level of physical fitness. Accommodations are at a B&B or local motel. We are able to hunt these bucks during the entire season from velvet and pre-rut when they have not been hunted for many months through the full rut. Since this is an archery only hunting zone, the whitetail deer remain largely undisturbed for the entire season. We conduct these hunts annually from September 1 > November 30. Detailed pricing of all our our hunts are available at Bookings. For the latest availability, dates and booking information, please Contact Us.